Do you have a mobile CRM strategy? If you don’t, its high time you consider creating one. It’s a mobile world we live in. People have embraced connected mobility with their smartphones and tablets that serve as mini computers with apps to help with virtually anything. You can use it for entertainment, shopping, online banking, work, doing business, and more. It’s a big business opportunity and a huge market that companies and businesses would do well to take full advantage of. A good, full-featured CRM software solution with mobile capabilities can help you. But the first thing you should do is craft a successful mobile CRM strategy. In this guide, we’ll show you how. What are the Best CRM Strategies & Techniques? Consider these – people today interact 2X more with brands on mobile than anywhere else (including TV, in-store, etc.) while 51% of customers say that they discover new brands and products through mobile devices. And here’s the game changer – most people are likely to recommend a brand after a positive mobile experience. On the business to business side of things, it was found out that half of all B2B search queries today are made on smartphones, and that an average of more than 40% of revenues in leading B2B organizations were driven or influenced by mobile. In fact, research shows that companies that are so-called “mobile leaders” far outrank “mobile laggards” in several vital areas as shown below. The realities and profitable potentials of mobile dictate that businesses fully align their sales and marketing strategies with the trend. One important area that should leverage mobile is your CRM process. Can your sales and marketing teams access CRM data on the go? Do you use mobile CRM systems? Do you even have a mobile CRM strategy? 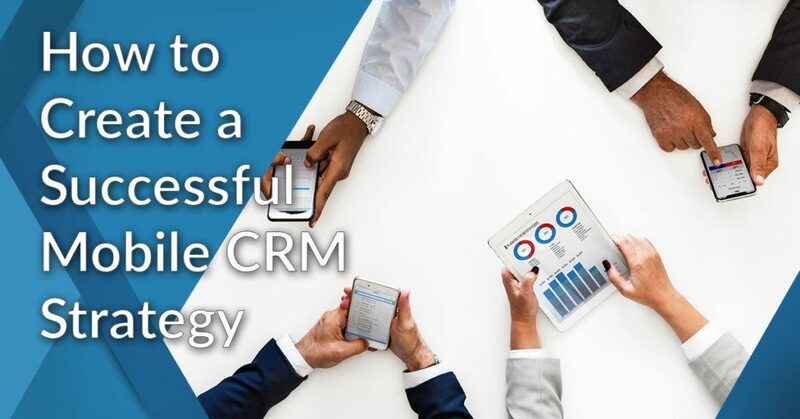 This strategy defines and spells out how to successfully leverage mobile technology in order to strengthen your CRM and drive more sales. Before we go further, you need to understand what mobile CRM is all about. Mobile customer relationship management lets you deliver a full CRM experience on smartphones, tablets, and other connected devices. It allows your sales, marketing, and customer service units to use mobile devices to access customer data and customer accounts in real time wherever they may be. Mobile CRM streamlines functionalities and features so that employees can do what they can from a small device as they do with a laptop without sacrificing its capabilities. Hence, mobile CRM is designed with intuitive navigation and user efficiency with simpler menus. In other words, it’ll take you just a few clicks or swipes to effectively use the CRM in your mobile device. Communication and collaboration are further boosted by mobile CRM, allowing your remote people to efficiently connect and be on the loop not only with your people in the office but also with other agents and reps in the field. Moreover, integration capabilities such as with analytics and data visualization tools provide your field people with easy, digestible data they can access instantly to guide their performance, actions, and decision making. Of course, there can be security concerns such as when smartphones or tablets are stolen, putting customer account information at risk. These are however addressed by having strong privacy policies implemented through your company’s mobile device management strategy as well as with security and authentication mechanisms built into the mobile CRM app. Harnessing the flexibility and convenience of mobile in tandem with your CRM tactics can bring you advantages and a competitive edge. Let’s take a look at how it applies to your best practices and methodologies. You get visibility over your customer journey by mapping their interactions with your business. It’s a visual representation of their every experience with you from the time they first became aware of your business, right through the engagement process, then conversion to buying customer, and into a continuing customer relationship. All throughout the journey map you gather data which can help you understand the needs of your customers, determine the downsides and highlights of your marketing efforts, assess engagement rates, and evaluate if you’re providing the best customer experience. The overall perspective you gain as well as insights you gather can guide you in making sound business decisions. Customer data usually comes from many sources. It is gathered from interactions your customers have with your business which include phone calls, emails, feedback, suggestions, inquiries on social media, live chat, survey answers, SMS, etc. There are many disparate data sources which, more often than not, are siloed in the different apps, tools, and systems used by different departments in your organization. Imagine your three core customer-facing units – sales, marketing, and customer support teams – each using its own collected data on one particular customer. That will result in a messy, uncoordinated, and error-prone situation that will in no way produce a revenue-generating operation. Personalization impacts not only revenue but also relationship. Build on a personal level those relationships with your customers and revenues will come flowing in. CRM data is even considered by some quarters as more important than financial data because with the former you are able to precisely provide what customers want and need to keep them buying, retain their loyalty to your brand, spread good word-of-mouth promotion, and entice new customers. All these redound to good business that positively affects your bottom line and delivers much-desired ROI. An Accenture survey found out that 1 in 2 consumers will do business with a retailer who knows them by name, and 2 in 3 shoppers will buy from a retailer who knows their purchase history. Personalization is thus a powerful and proven profit enhancer. The same survey points to the positive attitude of consumers when it comes to personalized services and offerings. These include being remembered, recognized, and offered relevant recommendations. Feedbacks are important for planning and carrying out an effective marketing campaign. You should know where you’re coming up short or exceeding expectations in your marketing activities and the best way to do that is to directly ask people who matter – your customers. You may already be in possession of relevant data on customer needs, trends, buying history, number of calls or queries, and other information. But do you know if your customer is satisfied with your product or has a good buying experience? With the right questions, there are many insights you can uncover from customers themselves. And from the responses, a CRM system can help you sort and sift through to give you metrics and help you understand your customers better so that by the next round of your marketing campaign you can introduce improvements to make it more effective. Automating your CRM processes takes off a lot of load from your sales team so they can focus on their primary business of selling. The sales force automation feature of most CRM solutions and sales tools help streamline and automate most sales tasks including analysis of sales forecast, contact management, order processing and tracking, inventory control and monitoring, and information sharing, among others. It facilitates lead conversion, reduces sales cycle duration, and improves sales agent productivity. Automation speeds up your workflows and streamlines your processes which eventually lead to the growth of business revenues. In all of the above, a mobile CRM lets you access all the important data, insights, information, updates, contacts lists, schedules, tasks, reports and more while outside the confines of your office. It’s a carry-on, bring with you, agile CRM to guide your decisions and next actions unhindered by time and location. Does your present business situation call for a mobile CRM solution? Will it drive innovation and be a game changer in your sales and marketing operation? Can it facilitate or optimize processes involved in your sales and marketing activity? Will it truly be convenient and useful for your sales and marketing team? Different businesses have different requirements. Study the value of implementing a mobile CRM system for your organization. You may think you do not need it now but feel better off having it sooner than later especially when you realize that most of your prospects and customers are interacting with you through mobile platforms. Do you think you can have a wider and more effective reach with your audience through mobile? You realize savings from efficiency, anytime availability of shared cloud data from any mobile device, and lower administrative costs. Your marketing teams can connect and reach customers on various channels – phone, email, social media, IM, SMS – directly from their mobile device. Your customer service unit can easily track cases from whatever channel, and resolve issues faster using a “single source of truth” or the unified knowledge from the entire organization. Your IT department gets a full mobile apps development platform with integration capabilities to your CRM system. Mobility, security, functionality, and convenience are but some of the benefits of mobile CRM solutions. From within your smartphones or tablets, you get features and functionality of the CRM software that’s hosted on your desktop PC or laptop, but with the big edge of anytime, anywhere access to cloud computing. In other words, you get to run your business on-the-go from your phone. Automatic updates ensure that sales agents always have at their fingertips the latest CRM data, reports, and analytics so they don’t miss vital information, always on the loop, and can move confidently with their leads, prospects, and customers. Moreover, mobile CRM platforms are equipped with built-in and auto-updated security features such as VPN and multi-level authentication. Similar to the advice of experts to implement your CRM strategy in phases to make it seamless, you should do the same with your mobile CRM. While it may seem convenient to have every member of your sales and marketing teams equipped right from the start with CRM apps on their mobile device, this may prove to be problematic and overwhelming to your team. As with any new undertaking that involves new technology, training, testing, and familiarization is required, and this can be done in stages. CRM software vendors usually provide training and technical assistance. Then you can test out how the mobile CRM system works with selected members of your team, after which you can sign on all potential users for trials runs. The point to all these is to make the system work smoothly for all its users to ensure adoption and acceptance. Having your team well-trained and proficient on the use of a mobile CRM will produce flawless operation, enhanced collaboration, improved team and individual efficiency and productivity, and deliver optimal customer experience – all of which are part of your expectations as outlined in your business use case. Mobile CRM will foster closer coordination with your team members and colleagues and lasting relationships with your customers, things you will achieve with a steady, organized, and trained roll out than with a full-blast, error-prone implementation. Employees nowadays are more agile and not confined to the four corners of the office. Mobile technology keeps employees connected, updated and productive, as the figures above show. It also eliminates boundaries, promoting close collaboration regardless if employees are located on the other side of the globe. Even your employees that do not directly deal with customers can benefit from using mobile CRM in producing reports, managing schedules, and organizing and accessing files from one location. The great thing about today’s crop of leading CRM solutions is that they come equipped with mobile apps, allowing you to bring your CRM with you on the go and access your contacts, emails, customer details, and other important CRM information wherever you are and whenever you need to. Here’s a look at some of the top mobile CRM apps. Award-winning CRM solution HubSpot CRM is well known for its proven sales and marketing tools and best practices that revolve around its inbound marketing principle. If you have to pick a CRM software to quickly lift your campaigns off the ground, HubSpot CRM should be on top of your list for a lot of good reasons – it’s free, easy and simple to use, flexible and powerful, has extensive integration, and blends with your existing sales processes. It also gives you a robust mobile CRM through its mobile app for iOS devices. The CRM software is 100% free and you can immediately get started with HubSpot CRM here. Easily access your CRM database so you can get contact records while on the go. Manage your full HubSpot stack (CRM, marketing, customer service) in one app. Customize your mobile digest to show the most important marketing and sales metrics. Keep tab of sales leaderboard, stay connected with your team, and get the latest updates. Receive pipeline insights to know the status of deals, and view contact and company timelines to manage your sales process on the move. Our Salesforce CRM reviews revealed the software for what it is – a most capable cloud platform powered by automation to help your sales team maximize CRM data and streamline processes. Part of Salesforce’s extensive sales and marketing solutions, the CRM software lets you track all customer information and interactions in one location to follow more leads, and nurture and manage them until they are ripe for conversion. It is designed to drive efficiency and productivity of your sales team whether they are in the field, at the office, or online. This is made possible with the availability of iOS and Android mobile apps that feature custom reports and real-time data. You can take the software for a spin. Just sign up for a Salesforce CRM free trial here. Get real-time dashboard views of reports and sales performance. It lets you join meetings, take in-app notes, and manage tasks on the go. Collaborate and instantly connect with your sales team and colleagues. You can upload files, and search, share, and edit them from your mobile device. With “mySalesforce”, you can build custom-branded mobile apps for your staff. We confirmed from our Freshsales overview why the software is often described as a single contact management hub – it is able to help you and your sales agents manage massive number of leads from one platform while keeping the process simple. The CRM solution in the Freshworks family of business apps is built for high-velocity teams to keep track of contacts as well as capture, distribute, nurture, score, and verify leads from multiple channels. It boasts of a powerful revenue analytics that can pull out data from relevant sources and process it to come up with accurate reports. Freshsales offers mobile apps for iOS and Android, giving you all sales CRM functionalities right on your smartphone. Why not test the software for yourself? Simply sign up for a Freshsales free trial here. Plan your day and manage your work through your mobile device. It only takes a tap to get information about your contacts, leads, deals, and accounts. Handle tasks, schedules, calls, follow-ups, and updates through your mobile device. Quickly meet with your clients by booking an Uber from within the mobile app. It provides mobile CRM push notifications so you won’t miss pending tasks and meetings. Among the many Pipedrive benefits you can gain are efficient sales management, speedy deal closure, well-organized lead collection, top-level statistics and reporting, and wide customization. Created through the combined experience and expertise of salespeople and web developers, you get a CRM system that is fast, feature-filled, easy to use, and with the sales pipeline methodology built into it, making it an ideal CRM and sales pipeline management platform for small and medium-sized businesses. It is also fully optimized across iOS and Android mobile devices. If you want to explore more its capabilities, sign up for a Pipedrive free trial here. It gives you a complete view of your tasks and to-do lists. You can set reminders and notifications for all activities. It lets you add meetings and call notes or even audio or photo notes to save time. You can bring your sales pipeline with you wherever you go. It can work offline so you can still get work done; once online, changes auto sync with Pipedrive to keep your information up-to-date. Going through Zoho CRM details exposed its core functionality of lead and contact management as well as capability to handle sales pipeline and purchase control. Combined with several other features, what it gives you is a powerful system that can streamline sales operations, automate tasks and workflows, access and analyze important data, and perform sales forecasting, among others. In addition, it provides a mobile platform that lets you take the CRM on location so can get fast and real-time updates and close more deals even when on the go. You can experience first hand how this CRM solution works. Just sign up for a Zoho CRM free trial here. You get instant access to your CRM information. Obtain real-time dashboard insights into team performance, sales trends, and more. A number of Lucrativ features are designed to boost the productivity of sales teams, capitalize on more opportunities, and close deals efficiently. This sales acceleration and CRM solution enables sales teams to consistently engage with their customers thanks to streamlined and automated workflows. Moreover, it has an assortment of productivity management tools that ensures they are always on top of all their responsibilities. With these functionalities, you can benefit from less lost opportunities and improved sales overall. Lucrativ also features gamification tools to empower and motivate your team to accomplish more tasks and achieve better results. Its workflow automation lets you set various scenario-based processes and have the software accomplish them automatically. You can always stay up to date with opportunities, notifications, milestones, and other information thanks to its mobile CRM application. You can empower your team to be more productive and efficient with its gamification features. Take advantage of productivity tools for better task prioritization, easy capturing of data, easy reminders for engaging clients, and more. You can benefit a lot from having a mobile CRM strategy. However, this is not something you set out hastily. It needs careful planning, committed adoption by your organization, proper training of users, and systematized roll out. Balance the time you need for a proper implementation because your mobile CRM will become one of the most important components in your overall CRM strategy and a success driver for your business. If you want to start off without worrying about cost, sign up for HubSpot free CRM here.